The 463rd Bomb Group said goodbye to one of their own at their annual reunion night; a man shot down and killed over Italy more than 70 years ago. 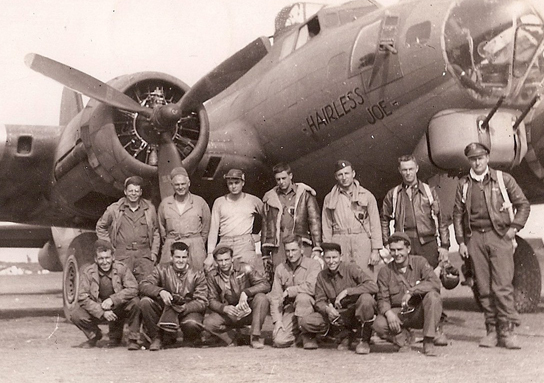 At the annual reunion of the 463rd Bomb Group, held this year in Albuquerque, veteran World War 2 historian and lecturer Bill Beigel of Torrance, California, told the story of “Hairless Joe,” a B-17 belonging to the Group, based in Italy. “Hairless Joe” was hit over its target of Marzabotto, Italy, on June 5, 1944. Six men killed. Five parachuted to safety. One of the six lost was Peter Paul Welsch of Chicago. Beigel told the story related to him by Welsch’s brother, Joe, of the terrible day the telegram arrived at their home, announcing that Peter was “Missing in Action.” Peter’s mom, Theresa, screamed in anguish when the news arrived and no one in the house ever forgot the sound of her voice that day. By November 3, 1946, Theresa still didn’t know whether her eldest son’s body had been recovered. After nearly 18 months of waiting, she wrote to the War Department imploring the Department to learn whether her son’s body had been found, for confirmation of whether he was truly dead, [so] “I could start living for the rest of the family. I have not been well just thinking of Pete . . . ”. Three years after the crash, with the help of dental records provided by Peter’s family dentist, his remains were located, identified, and buried at the U.S. military cemetery at Mirandola, Italy. It was 1949 by the time his remains were brought home to rest in Chicago at the request of his family. Beigel described how the United States was the only combatant nation in World War II to repatriate its military war dead. Very few people living today are aware of that fact, or of the agonizing decisions that families had to make regarding the final resting place of their lost fathers, sons, brothers or other loved ones. The “Return of the World War 2 Dead” is the subject of an upcoming book by Beigel. After the talk, the son of one veteran approached Beigel with a photo of Jesse Yanez, one of the crew of “Hairless Joe” killed in the crash. Yanez was serving as the tail gunner of the crew and lost his life when his section of the bomber took a direct hit from German anti-aircraft fire. Yanez had served with his father in training, only to be transferred away from the crew when they arrived in Italy. Beigel also spoke with a veteran pilot whose brother was killed in a training crash near Beigel’s home in Torrance, California. The veteran broke down in tears describing his brother’s death and told him that, like for the family of Welsch, the family was never the same afterward. Bill Beigel is an American military casualty researcher, specializing in facts relating to Americans who died or went missing in active duty in World War II and the wars with Korea and Vietnam. Bill’s research is intended to assist individuals and groups in learning the circumstances of military deaths in 20th-Century wars, as next-of-kin usually received very little information during wartime. To date, Beigel has researched more than sixteen hundred individuals for over a thousand clients. Bill Beigel holds a BA in History and a Masters in Geography, both from UCLA. His research is conducted at the behest of individuals, veterans groups, communities and universities and others. Bill Beigel’s work has been featured in USA Today, Fox News, CBS News, Los Angeles’s Daily Breeze, War History Online, and many other outlets. A large collection of Beigel’s research was recently accepted into the American Air Museum in Duxford, England. For more information, please visit http://ww2research.com or email bill.beigel@ww2research.com. awesome man. i like the mention of the upcoming book too!